Background: The quality of parenting is recognised to be hugely influential in predicting success in education, emotional security, and good health. Much is known about how to engage mothers in understanding the needs of their infant but fathers are much harder to reach. Only quite recently have fathers been seen as an important focus for information and education about young children. Yet there is evidence that more paternal involvement with a child leads to better educational outcomes. Methods: We have studied the effects of an age paced parenting newsletter in a birth cohort since 2002 using a randomised case control design. The newsletter is entitled Baby Express and is sent out to the parents’ home monthly in the first year of life and twice monthly thereafter. The content centres on emotional development, parent to child interaction, and play. We have shown that it is very popular with mothers and will be exploring the impact on child behaviour. Specific information for fathers is included. At around a year after the birth, fathers were surveyed using a specially designed questionnaire. We aimed to find out their concerns in relation to parenting, and the extent to which Baby Express met their needs for information. Results: 41 fathers of 75 (55%) responded, 37 had read some of Baby Express and all these thought it was relevant to fathers. 36 said that the information for fathers was enough and most found all parts of interest. Below we provide a sample of the comments received, first in relation to being a father and then in relation to the specific content of the newsletter. Being a father: “feeling of love and being needed that I get from our child”; “building a relationship with my son and watching him develop”; and “sleepless nights and working full time”. Comments on baby Express: “more relevant to fathers as men are less educated in things baby than mothers”; “it helps us understand and communicate better with our child”; “everything is new and unfamiliar and Baby Express explains what and when you can expect certain events to take place”; and “thank you Baby Express for the help your newsletter has given both my partner and me”. What should be included: “more in depth answers and what the father can do to reduce the risk of PND”; and “how to increase the bond between baby and dad especially at night when he wants his mam”. Conclusion: Baby Express has proved a popular and effective means of delivering information to fathers as well as mothers. There is a need for more targeted information for fathers of young infants in relation to child development, play, and common problems seen, as well as the special role of the father in parenting. Aims: To assess the effect of attention deficit hyperactivity disorder (ADHD) on everyday functioning, wellbeing, and quality of life of children in the UK. Methods: The Attention Deficit Hyperactivity Disorder Observational Research in Europe (ADORE) project is a prospective, non-interventional 2 year study of attention deficit hyperactivity disorder across Europe. In the UK 223 patients aged 6–18 were observed and assessed using the parent rated Strengths and Difficulties Questionnaire (SDQ), Child Health and Illness Profile (CHIP), and descriptive information on a broad range of outcomes, for example academic performance, bullying, and contact with the law or social services. 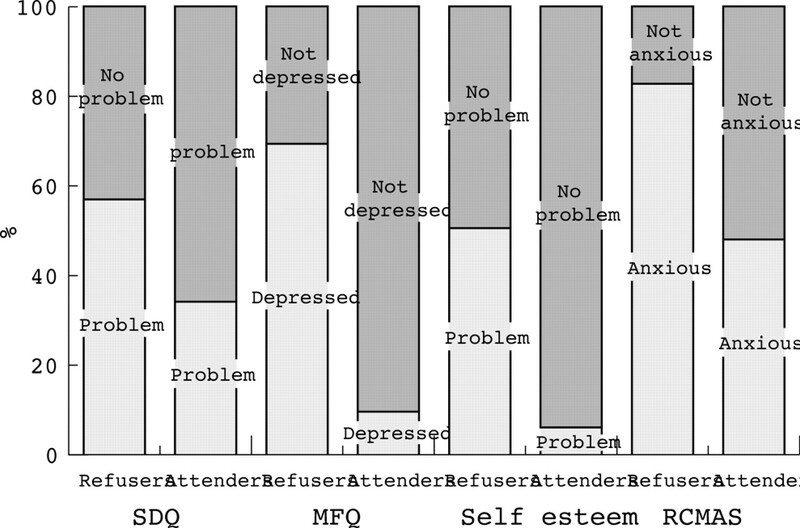 Results: Of the five CHIP domain scores, four were between 27–40 indicating significantly impaired quality of life (QoL) as this is 1–2 SDs below the general population mean of 50. The other domain, “risk avoidance”, scored approx 3SDs below the norm and was very low at 20.1. CHIP results also appear to get worse with an increase in ADHD severity (as measured by -V ADHD -Rating Scale). Information suggests that the presence of one or more comorbid disorders (and severity of) also impacts upon QoL giving lower reported CHIP scores. SDQ scores increase with ADHD-RS overall score, and tend to indicate increasing difficulties if comorbidity is present (anxiety, depression, conduct disorder, oppositional defiant disorder). Sleep problems are reported more than other health problems (56%) and they are associated with a negative impact on SDQ scores. In the school environment, over the preceding 6 months, 58% of UK patients were deemed unmanageable by their school, 35% had some exclusion from school lessons, and 29% were in a special education programme. 33% were involved in bullying (as victim or bully). Many parents of ADHD children also appear to have emotional and/or physical problems (54% of mothers, 32% of fathers), which in turn negatively affects the QoL of the child. Conclusions: ADHD has a substantial impact on the functional outcomes (for example, quality of life) of children with ADHD as assessed by their parents. Patients with more severe ADHD symptoms tend to have a poorer QoL. Background: Referrals of children for assessment of possible attention deficit hyperactivity disorder (ADHD) trebled over a 3 year period in one community trust. The clinic waiting time subsequently increased to 20 months. Aims: To introduce and assess the impact of a parent information session as the initial point of contact in the assessment of children with possible ADHD. Methods: A parent information session was introduced to initially target the parents of children who had been on the clinic waiting list for 9 months or more. The session was presented by the consultant community paediatrician and a specialist health visitor with an interest in child behaviour. Parents were invited to attend in groups and re-invites were sent if parents failed to attend on the first occasion. Information was shared with regard to the symptoms and difficulties experienced by children with ADHD, in addition to information regarding the assessment process and management. Introduction of a partial booking system with initial assessments carried out by the specialist health visitor enabled parents to arrange suitable appointment times. Ongoing assessment, diagnosis, and management were provided by both the consultant community paediatrician and specialist health visitor. Parental views were sought with regard to the assessment process by means of a semi-structured questionnaire. Results: Sixty four sets of parents were invited to attend a parent information session. The parents of 44 children on the waiting list attended. Telephone contact was made with parents who did not attend and following discussion these 20 children were discharged from the waiting list. The parents of 42 children requested further assessment. Of these children, 24 (37% of the initial group) had symptoms indicative of ADHD. Sixteen of these children were commenced on stimulant medication. Parents stated that the ADHD information session improved their knowledge of the symptoms and signs of ADHD (89%), the ADHD assessment process (89%), and the treatment available for ADHD (94%). Conclusion: The introduction of a parent information session for parents of children on the ADHD assessment waiting list enabled rational management of an escalating problem. It effectively reduced the number of patients waiting and facilitated a reduction in the waiting time to be seen. It reduced the number of wasted appointments by both non-attenders and unnecessary assessments. The sessions were viewed positively by parents, who became empowered in the assessment process. With the introduction of this initiative the waiting time to be seen for initial assessment at the ADHD clinic decreased from 20 months to 0 months in just 7 months! Objective: To evaluate the effectiveness, acceptability, and cost of the FRIENDS programme. Design: Uncontrolled before and after assessment. Subjects: 213 children aged 9 to 10 years. Intervention: The FRIENDS programme, a 10 session cognitive behaviour therapy programme. Main Outcome Measures: Spence Children’s Anxiety Scale, Culture free self-esteem questionnaire, qualitative assessment of acceptability, and cost analysis. Results: End of programme data from 197 children (92.5% of eligible sample) showed significantly lower rates of anxiety (t 2.95, df 384, p 0.003) and significantly improved levels of self-esteem (t 3.13, df 386, p 0.002). Significant improvements were obtained in over half of those children with the most severe emotional problems. 190 children (89.2%) of eligible sample completed qualitative assessment of acceptability. 154 (81.1%) thought it was fun; 147 (77.4%) would recommend it to a friend. 137 (72.8%) thought they had learned new skills and 78 (41.1%) had helped someone else with their new skills. The cost per child to deliver the 10 session programme from NHS perspective is £34.46 (£49.74 of proportion of start up and supervision costs included) in term 1 and reduces to £24.00 (£24.34 if proportion of supervision costs only included) in term 2. Conclusions: The FRIENDS programme appears to be an effective and acceptable way to promote emotional resilience (reduced anxiety and increased self-esteem) in primary school aged children, consistent with previous studies in Australia. Further controlled studies are needed to assess natural history of anxiety and self-esteem and whether benefits are maintained over time. Aims: This study aimed to compare the profiles for anxiety, depression, and self-esteem in young people who school refused, seen within a child and adolescent mental health service (CAMHS), and those assessed by a community paediatrician. Methods: Three prospective groups were compared; school refusers referred to a CAMHS service (28 cases), school refusers referred to a community paediatric service (22 cases) and a control group of school attendees matched for age and school (33 cases). Four child and parent sets of questionnaires were used. Results: We showed that 76.2% of cases referred to community paediatrics showed evidence of depression, 70.6% suggested low self-esteem, and 89.5% showed high levels of anxiety. We showed that there are no significant differences in the scores on the questionnaires between the referrals to community paediatrics and CAMHS. Conclusion: There are high levels of psychological symptoms found in young people who school refuse. There are no significant differences in the symptomatology in those seen within a community paediatric service and those seen within a CAMHS. Training and service configuration does not reflect this at the moment. G118 WHAT SORT OF QUALITY OF LIFE DO OBESE CHILDREN AND ADOLESCENTS IN THE UK HAVE? Background: Research in the USA has found that obese youth not only have a poorer quality of life than their healthy weight peers, but that the quality is as low or lower than young people diagnosed with cancer. Aims: To ascertain the quality of life of obese children and adolescents involved in a community based intervention programme in the UK and to compare these scores with those reported from the USA. Conclusions: Obesity has as much of an impact on young people’s quality of life here in the UK as it does in the USA. Shockingly, it has been shown to be worse than the quality of life experienced by children suffering from cancer. Services and society need to be aware of the extremity of the problems faced by obese young people in their every day lives. Aims: To evaluate the ways in which children with inflammatory bowel disease (IBD) and their parents cope with their disease and to assess their family functioning. Methods: 90 children (51 boys) with IBD (58 Crohn’s disease, 12 ulcerative colitis, 20 indeterminate colitis) aged 8–17 years completed the Kidcope questionnaire. 87 parents or guardians completed the Ways of Coping scale and 84 completed the McMaster Family Assessment Device. Results: Children with IBD used cognitive restructuring as the principle way of coping (boys 86%, girls 85%). Other popular coping strategies included wishful thinking (boys 84%, girls 82%), distraction (boys 73%, girls 81%), and seeking social support (boys 71%, girls 77%). When evaluated by age (young 8–12 years, old 13+ years) cognitive restructuring (positive reinterpretation of events) was used by 88% (old) and 83% (young), wishful thinking was used by 78% (old) and 90% (young), and distraction techniques were used by 72% (old) and 83% (young). Adolescents were more likely to accept their disease with 88% adopting resignation compared to only 23% of the young group (z −6.7, p 0.001). Parents engaged in problem solving strategies (78%), seeking social support (77%), and self-control (49%) as principal ways of dealing with their child’s IBD. Mean scores for domains of family functioning were generally “healthy” and similar to previous studies of “normal” families. Conclusions: Children with IBD and their parents use many different coping strategies. These are similar in boys and girls and at different ages except that older children were more likely to be resigned to their illness than younger children. Family functioning appears to be healthy and similar to that in families who do not have a chronically ill child. G120 NICE GUIDELINES ON SELF-HARM… SHOULD ADOLESCENT ALCOHOL OVERDOSES BE INCLUDED? Aims: Observation of admissions for self-harm and alcohol overdose to the Children’s Rapid Access Unit (CRAU) at a district general hospital has shown a recent increase. The July 2004 NICE guidelines on the management of self-harm define self-harm as “self-poisoning or injury irrespective of the apparent purpose of the act”. To identify children and young people admitted for self-harm, an audit was conducted. The aim was to establish the incidence and management of children presenting with self-harm to the CRAU. Methods: Conclusion A retrospective audit of children admitted to the CRAU from August 2002–2004 included children diagnosed with self-harm, namely self-inflicted physical injury, alcohol intoxication, drug overdose, and suicidal intentions. Children who had accidentally overdosed were excluded. Results: The majority of admissions were females aged 13–15 years. Drug overdoses accounted for over 50% of the total admissions in the category of self-harm, and alcohol overdoses for approximately 40%. Self-inflicted injury accounted for a minority of admissions. Approximately 50% of all children were seen by the Child and Adolescent Mental Health Services (CAMHS) before they were discharged. A significant number of those not assessed by the CAMHS were children with alcohol overdoses who were deemed to be inappropriate referrals by the paediatric team. Most children were admitted between 18.00 and 08.00 hours and were seen by the CAMHS between 6 to 24 hours later. Conclusion: Our audit demonstrates that there was inadequate response to the needs of children presenting with self-harm. This may have been related to the time of admission and to the CAMHS only providing a daytime service for non-emergencies. Self-harm by alcohol overdose failed to receive the same management as other types of self-harm behaviour. Alcohol overdoses accounted for a large proportion of admissions but were not referred to the CAMHS. These cases were attributed to isolated incidences of recreational alcohol use and were rarely considered in the wider category of self-harm. However, these children clearly fall within the NICE definition of self-harm, and we suggest that it is appropriate to include this group in referrals to mental health services, as recommended by NICE.